FORT RUCKER, Ala. (November 14, 2014) -- From scientists and politicians to human rights activists and countless Average Joes, it's taken a lot of innovation, sacrifice and hard work to get the United States of America from the first shots of revolution to where it stands today. But one group's members can argue, and many would agree, that without them and all that they did, the rest wouldn't have happened. That group, U.S. military veterans, took center stage at Fort Rucker during the post's Veterans Day ceremony Nov. 7, which featured veterans from all services and every conflict dating from World War II to today; aircraft from the Coast Guard, Air Force, Army and a vintage AH-1 Cobra; and Maj. Gen. Michael D. Lundy, U.S. Army Aviation Center of Excellence and Fort Rucker commanding general serving as the speaker. "Since the American Revolution in 1775, men and women have answered the call of duty and proudly served this great country in the armed services. Each and every one of them are now veterans," he said. "Serving a higher purpose and something bigger than themselves, veterans have endured great personal sacrifice and danger while abiding by their solemn oath to defend the United States of America against all enemies, foreign and domestic. "From the early days of the revolution to the American Civil War to the two World Wars, Korea, Vietnam, and our most recent conflicts in Iraq and Afghanistan, veterans from across this great country have stood strong to preserve the ideals of freedom and liberty, while always maintaining the trust of the people that they serve -- the American people," Lundy continued. "All (the veterans) that we honor today served something bigger than themselves: a profession -- the profession of arms," the general said. "A profession that spans almost 2 1/2 centuries back to the genesis of our great nation. A profession that is bound by an oath to support and defend the Constitution and obey the orders of the president of the United States. A profession built on an ethos of trust -- trust that is built on personal character, personal abilities, personal strength and personal word. A profession that is underpinned by the shared values of loyalty, duty, respect, selfless service, honor, integrity and personal courage. A profession that recognized that our veterans are duty bound to uphold their oath, embody the values of our nation, and founded in ethos there is no greater responsibility or honor than to protect those that they serve -- our citizens." He added that today's veterans stand as a testament to that ethos, and clearly demonstrate "remarkable personal courage and loyalty to the nation." "I'm honored today to recognize these veterans and their families, and especially our Gold Star families who are with us here today," he said. "It is difficult to find the right words to truly express how important each of you are to our nation and to her people. What you have done and continue to do is important, and words will never be enough to fully capture the impact you've had on our nation and our allies around the world. "You made this world better. You kept our nation safe. You helped our friends in their darkest hours. And you always stood strong in the face of great peril," Lundy added. "But most importantly, you each left a legacy in the veterans that followed in your footsteps. Fellow citizens who have and will continue to answer the call to follow the honorable example that each of you have shown. "So today, just simply know that this nation and her citizens are grateful for the sacrifices each of you have made to preserve liberty, freedom and our way of life," he said. "God bless this great nation, and watch over all of our Soldiers, our Sailors, our Airmen, our Marines and our Coast Guardsmen who are on watch and are in harm's way today all around the world. Thank you for joining us and, most especially, thank you for your service." Retired Air Force Lt. Col. George Hardy, one of the original Tuskegee Airmen, was the special guest during the ceremony, and he said he was grateful for the honor. "It's just an honor to be here -- I'm so proud that they invited me to be here," he said. "We had a lot to fight against years ago. The services were really racially segregated, so we had several battles to fight, and we overcame them all. 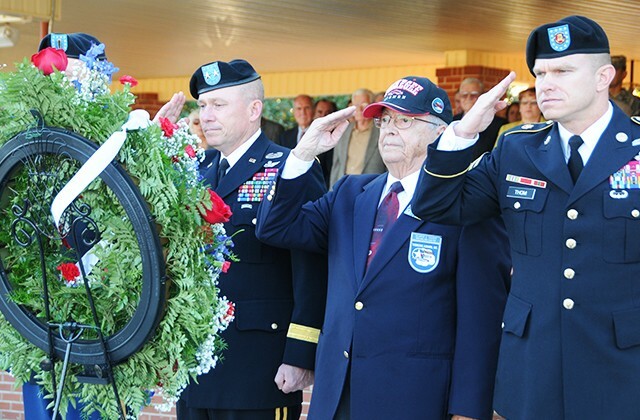 "When I went into the service in WWII in 1943, I was in the Army, and it was Army Air Forces, so I knew the Army, wore the Army uniform, and I'm very proud of that," he said. Another veteran, retired CW4 Robert Cooper, who spent 30 years on active duty and is now a post commander for the Veterans of Foreign Wars, said the ceremony reminds him that "freedom is not free." "The reason we have freedom today is because of the veterans that served over the years," he said. "And the best hope for our nation is when we see young folks in JROTC (Junior Reserve Officer Training Corps) programs and the group we had last night at the ceremony singing patriotic songs." The Fort Rucker schools also honored veterans during separate ceremonies. The Fort Rucker Primary School hosted its ceremony Nov. 7 and the Fort Rucker Elementary School hosted its ceremony Nov.10. 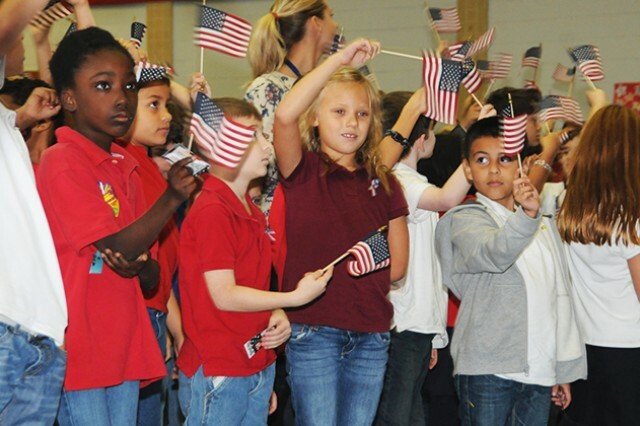 The elementary school's students and staff lined the halls to welcome service members, family members and veterans by waving flags, enthusiastically expressing gratitude for their service, offering up high-fives and even giving out handmade cards to a fortunate few. Lundy was also on hand at the elementary school, where, after getting enthusiastic "Hooahs," and even an "Oorah," in honor of the Marine Corps, out of the student body, he told the crowd that veterans are ordinary people doing extraordinary things. "They do understand that freedom doesn't come free, so they're willing to make great sacrifices," he said. "They may separate themselves from their families for long periods of time, they'll face great danger out there all around the world, but they're all doing it for you. And today, as we sit here and we look at this ceremony, I will tell you that it reaffirms in me of why we do this -- because of all of our young citizens we have out there so you can grow up with freedom and liberty, and be able to pursue happiness like our founders wanted. "And that's what veterans do. Veterans secure freedom, and they place themselves in harm's way, if necessary, so we can assure that our way of life continues for this great nation," Lundy said. "So today, they won't ask you for a lot, just a simple thank you is enough for the veterans that are out there. So, when you see your veteran, especially if they're your mom or dad, tell them thank you, give them a big hug, and they will continue to do the things they need to do to protect our great nation."